This Guide is based on Rails 2.3. Some of the code shown here will not work in older versions of Rails. 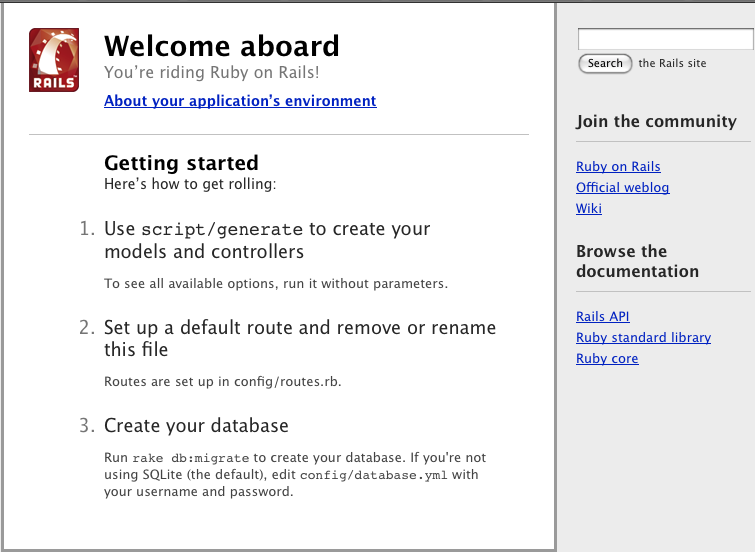 Rails is a web development framework written in the Ruby language. It is designed to make programming web applications easier by making several assumptions about what every developer needs to get started. It allows you to write less code while accomplishing more than many other languages and frameworks. Longtime Rails developers also report that it makes web application development more fun. Rails is opinionated software. That is, it assumes that there is a best way to do things, and it’s designed to encourage that best way – and in some cases to discourage alternatives. If you learn “The Rails Way” you’ll probably discover a tremendous increase in productivity. If you persist in bringing old habits from other languages to your Rails development, and trying to use patterns you learned elsewhere, you may have a less happy experience. Transferring representations of the state of that resource between system components. would be understood to refer to a photo resource with the ID of 17, and to indicate a desired action – deleting that resource. REST is a natural style for the architecture of web applications, and Rails makes it even more natural by using conventions to shield you from some of the RESTful complexities and browser quirks. If you follow this guide, you’ll create a Rails project called blog, a (very) simple weblog. Before you can start building the application, you need to make sure that you have Rails itself installed. If you’re working on Windows, you may find it easier to install Instant Rails. Be aware, though, that Instant Rails releases tend to lag seriously behind the actual Rails version. Also, you will find that Rails development on Windows is overall less pleasant than on other operating systems. If at all possible, we suggest that you install a Linux virtual machine and use that for Rails development, instead of using Windows. If you want to keep up with cutting-edge changes to Rails, you’ll want to clone the Rails source code from github. This is not recommended as an option for beginners, though. TIP. You can see all of the switches that the Rails application builder accepts by running rails -h.
README This is a brief instruction manual for your application. Use it to tell others what your application does, how to set it up, and so on. Rakefile This file contains batch jobs that can be run from the terminal. app/ Contains the controllers, models, and views for your application. You’ll focus on this folder for the remainder of this guide. config/ Configure your application’s runtime rules, routes, database, and more. db/ Shows your current database schema, as well as the database migrations. You’ll learn about migrations shortly. doc/ In-depth documentation for your application. lib/ Extended modules for your application (not covered in this guide). script/ Scripts provided by Rails to do recurring tasks, such as benchmarking, plugin installation, and starting the console or the web server. vendor/ A place for third-party code. In a typical Rails application, this includes Ruby Gems, the Rails source code (if you install it into your project) and plugins containing additional prepackaged functionality. The production environment is used when you deploy your application for the world to use. Rails comes with built-in support for SQLite, which is a lightweight serverless database application. While a busy production environment may overload SQLite, it works well for development and testing. Rails defaults to using a SQLite database when creating a new project, but you can always change it later. If your development computer’s MySQL installation includes a root user with an empty password, this configuration should work for you. Otherwise, change the username and password in the development section as appropriate. Change the username and password in the development section as appropriate. Rake is a general-purpose command-runner that Rails uses for many things. You can see the list of available rake commands in your application by running rake -T.
TIP. If you’re on Windows, or your Ruby is set up in some non-standard fashion, you may need to explicitly pass Rails script commands to Ruby: ruby script/generate controller home index. TIP. To stop the web server, hit Ctrl+C in the terminal window where it’s running. In development mode, Rails does not generally require you to stop the server; changes you make in files will be automatically picked up by the server. The “Welcome Aboard” page is the smoke test for a new Rails application: it makes sure that you have your software configured correctly enough to serve a page. To view the page you just created, navigate to http://localhost:3000/home/index. The default routes handle simple requests such as /home/index: Rails translates that into a call to the index action in the home controller. As another example, /posts/edit/1 would run the edit action in the posts controller with an id of 1. This line illustrates one tiny bit of the “convention over configuration” approach: if you don’t specify an action, Rails assumes the index action. Now if you navigate to http://localhost:3000 in your browser, you’ll see the home/index view. Rails scaffolding is a quick way to generate some of the major pieces of an application. If you want to create the models, views, and controllers for a new resource in a single operation, scaffolding is the tool for the job. While scaffolding will get you up and running quickly, the “one size fits all” code that it generates is unlikely to be a perfect fit for your application. In most cases, you’ll need to customize the generated code. Many experienced Rails developers avoid scaffolding entirely, preferring to write all or most of their source code from scratch. One of the products of the script/generate scaffold command is a database migration. Migrations are Ruby classes that are designed to make it simple to create and modify database tables. Rails uses rake commands to run migrations, and it’s possible to undo a migration after it’s been applied to your database. Migration filenames include a timestamp to ensure that they’re processed in the order that they were created. If you were to translate that into words, it says something like: when this migration is run, create a table named posts with two string columns (name and title) and a text column (content), and generate timestamp fields to track record creation and updating. You can learn the detailed syntax for migrations in the Rails Database Migrations guide. Remember, you can’t run migrations before running rake db:create to create your database, as we covered earlier. Because you’re working in the development environment by default, this command will apply to the database defined in the development section of your config/database.yml file. The link_to method is one of Rails’ built-in view helpers. It creates a hyperlink based on text to display and where to go – in this case, to the path for posts. This is the result of Rails rendering the index view of your posts. There aren’t currently any posts in the database, but if you click the New Post link you can create one. After that, you’ll find that you can edit posts, look at their details, or destroy them. All of the logic and HTML to handle this was built by the single script/generate scaffold command. TIP. In development mode (which is what you’re working in by default), Rails reloads your application with every browser request, so there’s no need to stop and restart the web server. Congratulations, you’re riding the rails! Now it’s time to see how it all works. There isn’t much to this file – but note that the Post class inherits from ActiveRecord::Base. Active Record supplies a great deal of functionality to your Rails models for free, including basic database CRUD (Create, Read, Update, Destroy) operations, data validation, as well as sophisticated search support and the ability to relate multiple models to one another. These changes will ensure that all posts have a name and a title, and that the title is at least five characters long. Rails can validate a variety of conditions in a model, including the presence or uniqueness of columns, their format, and the existence of associated objects. This code shows creating a new Post instance, attempting to save it and getting false for a return value (indicating that the save failed), and inspecting the errors of the post. Unlike the development web server, the console does not automatically load your code afresh for each line. If you make changes to your models while the console is open, type reload! at the console prompt to load them. This code sets the @posts instance variable to an array of all posts in the database. Post.find(:all) or Post.all calls the Post model to return all of the posts that are currently in the database, with no limiting conditions. For more information on finding records with Active Record, see Active Record Query Interface. edit_post_path is a helper that Rails provides as part of RESTful routing. You’ll see a variety of these helpers for the different actions that the controller includes. TIP. For more details on the rendering process, see Layouts and Rendering in Rails. Now when you refresh the /posts page, you’ll see a gray background to the page. This same gray background will be used throughout all the views for posts. The form_for block is used to create an HTML form. Within this block, you have access to methods to build various controls on the form. For example, f.text_field :name tells Rails to create a text input on the form, and to hook it up to the name attribute of the instance being displayed. You can only use these methods with attributes of the model that the form is based on (in this case name, title, and content). Rails uses form_for in preference to having your write raw HTML because the code is more succinct, and because it explicitly ties the form to a particular model instance. If you need to create an HTML form that displays arbitrary fields, not tied to a model, you should use the form_tag method, which provides shortcuts for building forms that are not necessarily tied to a model instance. The create action instantiates a new Post object from the data supplied by the user on the form, which Rails makes available in the params hash. After saving the new post, it uses flash[:notice] to create an informational message for the user, and redirects to the show action for the post. If there’s any problem, the create action just shows the new view a second time, with any error messages. In the update action, Rails first uses the :id parameter passed back from the edit view to locate the database record that’s being edited. The update_attributes call then takes the rest of the parameters from the request and applies them to this record. If all goes well, the user is redirected to the post’s show view. If there are any problems, it’s back to edit to correct them. Sharp-eyed readers will have noticed that the form_for declaration is identical for the new and edit views. Rails generates different code for the two forms because it’s smart enough to notice that in the one case it’s being passed a new record that has never been saved, and in the other case an existing record that has already been saved to the database. In a production Rails application, you would ordinarily eliminate this duplication by moving identical code to a partial template, which you could then include in both parent templates. But the scaffold generator tries not to make too many assumptions, and generates code that’s easy to modify if you want different forms for create and edit. The destroy method of an Active Record model instance removes the corresponding record from the database. After that’s done, there isn’t any record to display, so Rails redirects the user’s browser to the index view for the model. At this point, it’s worth looking at some of the tools that Rails provides to eliminate duplication in your code. In particular, you can use partials to clean up duplication in views and filters to help with duplication in controllers. As you saw earlier, the scaffold-generated views for the new and edit actions are largely identical. You can pull the shared code out into a partial template. This requires editing the new and edit views, and adding a new template. The new _form.html.erb template should be saved in the same app/views/posts folder as the files from which it is being extracted. Note that the name of this file begins with an underscore; that’s the Rails naming convention for partial templates. Now, when Rails renders the new or edit view, it will insert the _form partial at the indicated point. Note the naming convention for partials: if you refer to a partial named form inside of a view, the corresponding file is _form.html.erb, with a leading underscore. For more information on partials, refer to the Layouts and Rending in Rails guide. Rails runs before filters before any action in the controller. You can use the :only clause to limit a before filter to only certain actions, or an :except clause to specifically skip a before filter for certain actions. Rails also allows you to define after filters that run after processing an action, as well as around filters that surround the processing of actions. Filters can also be defined in external classes to make it easy to share them between controllers. For more information on filters, see the Action Controller Overview guide. Now that you’ve seen what’s in a model built with scaffolding, it’s time to add a second model to the application. The second model will handle comments on blog posts. test/unit/comment_test.rb and test/fixtures/comments.yml – The test harness. This is very similar to the post.rb model that you saw earlier. The difference is the line belongs_to :post, which sets up an Active Record association. You’ll learn a little about associations in the next section of this guide. Rails is smart enough to only execute the migrations that have not already been run against the current database. These two declarations enable a good bit of automatic behavior. For example, if you have an instance variable @post containing a post, you can retrieve all the comments belonging to that post as the array @post.comments. This creates comments as a nested resource within posts. This is another part of capturing the hierarchical relationship that exists between posts and comments. For more information on routing, see the Rails Routing from the Outside In guide. You’ll see a bit more complexity here than you did in the controller for posts. That’s a side-effect of the nesting that you’ve set up; each request for a comment has to keep track of the post to which the comment is attached. This creates a new Comment object and sets up the post_id field to have the id from the specified Post object in a single operation. Because you skipped scaffolding, you’ll need to build views for comments “by hand.” Invoking script/generate controller will give you skeleton views, but they’ll be devoid of actual content. Here’s a first pass at fleshing out the comment views. Again, the added complexity here (compared to the views you saw for managing posts) comes from the necessity of juggling a post and its comments at the same time. Note that each post has its own individual comments collection, accessible as @post.comments. That’s a consequence of the declarative associations in the models. Path helpers such as post_comments_path come from the nested route declaration in config/routes.rb. The :allow_destroy option on the nested attribute declaration tells Rails to display a “remove” checkbox on the view that you’ll build shortly. The :reject_if option prevents saving new tags that do not have any attributes filled in. With these changes in place, you’ll find that you can edit a post and its tags directly on the same view. Running rake doc:guides will put a full copy of the Rails Guides in the /doc/guides folder of your application. Open /doc/guides/index.html in your web browser to explore the Guides. Running rake doc:rails will put a full copy of the API documentation for Rails in the /doc/api folder of your application. Open /doc/api/index.html in your web browser to explore the API documentation.